Naoki Yoshida discusses the transition to A Realm Reborn, from rebuilding the world to redesigning the servers. It is a sense of pride, honor and duty that has led to this point. 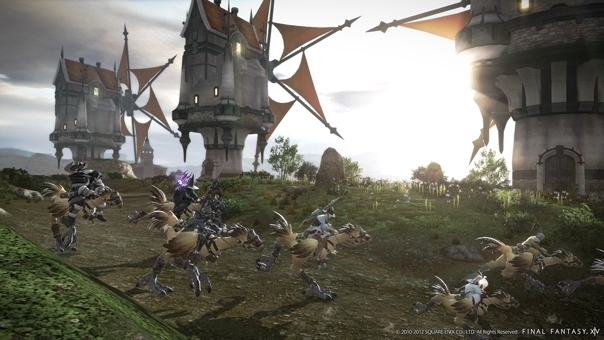 After Yoichi Wada, President and CEO of Square Enix, decided to remake Final Fantasy XIV (FFXIV), the team has been instructed to “stop at nothing” in creating a new version. Since that announcement, Producer/Director Naoki Yoshida has shepherded the current version through a number of updates and revisions, while planning for its eventual replacement in A Realm Reborn. It’s this new game – not an expansion pack or content update – where Square Enix hopes to make good that unspoken contract between the studio and its fans. At Gamescom I had the chance to see it for myself, as I was taken through some of the early areas and shown the revamped interface. First impressions are fantastic: A Realm Reborn has that snappy animation and exaggerated combat that is the hallmark of any Final Fantasy game. From Yoshida, I also got this strong sense of loyalty to the community. As I interviewed him about the transition from FFXIV to A Realm Reborn, I was surprised by just how much of the original game the team had decided to scrap in order to make the new experience better. The changes aren’t superficial, but run through every aspect from server systems to story presentation. From the outset, Yoshida was eager to stress that A Realm Reborn is not an expansion or version update, but a completely new game. The difference is so stark that Square Enix considers it the next member game in the Final Fantasy series. In order to demonstrate just how much has been revamped or redeveloped, I was treated to a tour of what had already been remade. It’s not just the window that’s changed, but the world behind it as well. Almost every aspect of the landscape is completely new. “For the field maps, we completely redesigned them. Scrapped the old maps and built completely new ones. Absolutely nothing from the originals remain.” The only areas that will feel remotely familiar are the cities. “Because they are so huge, creating assets for all of these would have been a very large undertaking. So what we decided was, rather than redesign and rebuild the cities, we would tweak them.” Yoshida then explained that these changes would bring things like shops closer together, making cities more compact and easier to use. All of this gorgeousness is delivered by a new graphics engine, which Yoshida thinks will stand the test of time. “We believe that our new engine and visual look will give the highest quality graphics you’ll see in any MMO. We hope to have it at this high standard for at least a ten year lifespan.” He’s also confident that those playing FFXIV now will be able to experience visuals this stunning. “You won’t need a super high-end PC to be able to play it at these high settings.” While the PlayStation 3 version might have lower textures or a shorter draw distance due to hardware limitations, it should still look very similar. “One of those things we’re doing is bringing back the Limit Break system. Rather than being a solo-based system, it’s a party-based system. It gets across that MMO feel – you’re not just doing it by yourself.” In a demonstration video that’s included below, it’s the Black Mage in the party who initiated the Limit Break, triggering the Meteor ability. If the party Paladin triggered it, the effect would have been different. Yoshida’s goal is that it adds a strategy element to group combat.